How did the museum lose it? Dinosaurs were the biggest creatures to ever walk the earth. And the Barosaurus was one of the biggest of them all. One hundred and fifty million years ago they roamed what is now western North America. Today, Barosaurus skeletons are extremely rare. The ROM had one. But they lost it. 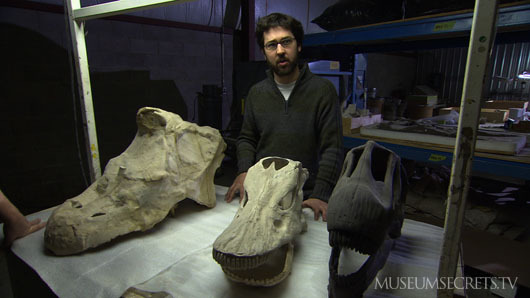 How a dinosaur was lost and found again is is revealed in Museum Secrets: Inside The Royal Ontario Museum. You may think it would be tough for anyone to lose a dinosaur skeleton. And once the fossilized bones are put together into a complete specimen that would be true. But imagine the bones are scattered throughout a vast storehouse of other bones, many without labels. That was the situation when David Evans became a curator at the ROM. The enormous skeleton of a Sauropod was hiding in plain sight… in the storerooms of the museum. How did David realize it was there? Watch the episode to find out, or… scroll down for the SPOILER. David got his first clue while on a plane to the western USA. He was intending to spend several weeks in the badlands hunting for dinosaur fossils. But as he whiled away the journey by reading an academic journal, he came upon a reference to dinosaur bones that were transferred to the ROM in 1962. Later David would realize that he may have been the first person in history to discover a dinosaur at 30 thousand feet. He took the first available return flight, rushed back to the museum, and searched through dusty file drawers and storerooms. 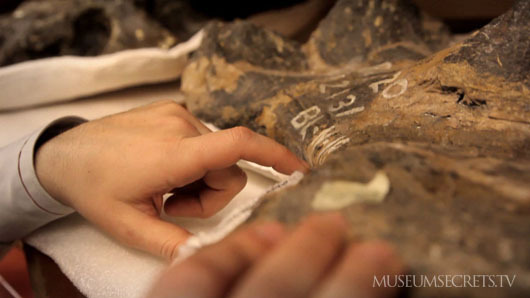 Scattered in scores of locations were hundreds of uncataloged dinosaur bones. And not just any dinosaur bones. In the bowels of the museum, David had discovered a Barosaurus – one of the largest and rarest of all dinosaurs. Once the dinosaur bones were found, museum staff had a new mission: put them together in time for the opening of the museum's brand new dinosaur wing. How did curators put together a complete dinosaur skeleton in just 8 weeks? 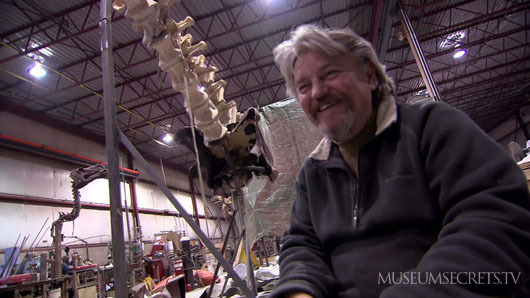 For the answer, we invite you to watch two Web Exclusive Videos: Take a video walkabout in the Dino Workshop, then watch Dino Assembly to see the Barosaurus come together bone by bone. The Barosaurus has one feature that is an evolutionary secret: a neck that appears impossibly long. Why it had such a long neck is a mystery for which curator David Evans has 3 possible answers. We invite you decide which one is right as you watch this Web Exclusive Video: Neck Impossible. Is there a bigger and/or better example of the Barosaurus in any other museum in the world? Well... New Yorks' American Museum of Natural History has a good example, though it is comprised of more replica bones and fewer real fossils than the ROM's Barosaurus. Pretty impressive though, as you can see right here.